7/19 Cup of Coffee: The affiliates split things on the farm with Pawtucket, Lowell and the DSL Red Sox all coming away with victories. Pawtucket was saved by the long ball while the bats exploded in Lowell to help lead the Spinners. Portland pitching got knocked around while the Salem offense couldn't get going. Pawtucket hung on to defeat the Buffalo Bisons, 4-3. Steven Wright went eight innings giving up three runs on six hits with two walks and two strikeouts. Most of the damage against Wright was done in the first inning when he gave up a single and an RBI double to start the game but was able to settle down after that. Tommy Layne came on in the ninth to earn his ninth save on the season. The Pawtucket offense scattered their four runs across four innings. Will Middlebrooks hit a sacrifice fly in the first to cut the Buffalo lead to, 2-1. Jonathan Herrera tied things up in the fifth with an RBI single to left field scoring Corey Brown. Alex Hassan hit a solo shot in the sixth and Dan Butler hit a solo shot of his own in the seventh to give Pawtucket the lead. Deven Marrero also chipped in with two singles to go 2 for 4 on the night. 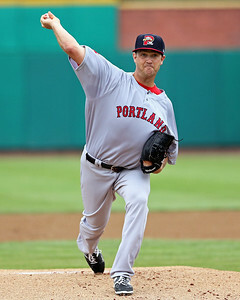 Portland fell to the New Hampshire Fisher Cats, 7-4. Jeremy Kehrt took the loss for Portland going only four innings and getting knocked around for seven earned runs on eight hits, three of which left the ball park. Pete Ruiz came on to give three strong innings of relief giving up only two hits and striking out five. Derrik Gibson was the lone bright spot at the plate for Portland going 3 for 5 with a run batted in. Blake Swihart went hitless on the night with two strikeouts. Portland struck out 10 times on the night collectively. Salem's late rally fell short as they lost to the Frederick Keys (BAL), 4-2. Joe Gunkel took the loss despite 6 2/3 innings, allowing only three runs on seven hits and two walks while striking out three. Matty Ott and Kyle Kraus combined for 2 1/3 innings of one-hit, one-run baseball to finish the game. Aneury Tavarez has Salem's only multi-hit game, going 2 for 4 with a double. Jantzen Witte, who was 1 for 5, took home Salem's only other extra-base hit, a double as well. Matty Johnson and Mario Martinez scored in the eighth and ninth, respectively, but it was not enough to push the Red Sox over the top. Greenville's game against the Asheville Tourists was rained out and will be made up as part of a doubleheader on Saturday. The Lowell Spinners took down the Batavia Muckdogs, 11-2. Kevin McAvoy started the game and pitched two perfect innings with two strike outs. Mario Alcantara came on and pitched two innings of his own and gave up a hit, a run and struck out three batters to earn the victory. Lowell had four players with multiple hit games on the night and scattered 14 hits. Leading the way was Mike Meyers who went 3 for 5 with two singles a triple and three runs batted in. Sam Travis also chipped in with a 3 for 5 night of his own and two runs batted in. All but two starters for Lowell had hits on the night. The GCL Red Sox were downed by the GCL Twins, 4-2. Michael Kopech went two scoreless innings with two strikeouts. Jose Almonte pitched two innings of his own and didn't fare as well. He gave up two runs on five hits and walked four batters. Josh Ockimey was the lone standout at the plate for the Red Sox going 2 for 4 with an RBI. The DSL Red sox pounded the DSL Cardinals, 10-2. The Red Sox smacked 12 hits, four of which went for extra-bases. Jhonathan Diaz went five scoreless innings for his second win in as many starts to move his record to 4-2. He gave up two hits and struck out five. Luis Alexander Basabe led the way offensively for the Red Sox going 3 for 5 with a double, a triple two RBI's and two runs scored. Isaias Lucena and Gerardo Carrizalez chipped in with two hits apiece and two RBI's. Player of the Night: Leading the way in Lowell's offensive explosion was Mike Meyers. Meyers had only two hits in his five previous games before he went off for a 3 for 5 night including a triple and three runs batted in. Despite batting .228 on the season, Meyers is hitting a nifty .308 over his last 10 games.